Lucy B. McCrone (1923-2011) was senior research microscopist and wife of the late Dr. Walter C. McCrone. 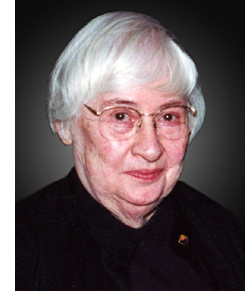 Mrs. McCrone was a charter member and director of McCrone Research Institute in Chicago from 1960 until 2011. Lucy was born in 1923 in Buffalo, and received a B.A. in chemistry from Wellesley College in 1945. After graduating, Lucy was hired as analytical chemist at Arthur D. Little in Cambridge, Mass., where she worked from 1945 to 1957. In her laboratory, she met Dr. McCrone, who was there on a consulting visit. She fell in love and married him in 1957, and came to Chicago to work as a chemical microscopist for Walter C. McCrone Associates. In 1960, Lucy and Dr. McCrone founded the McCrone Research Institute in Chicago, where she went to work full time after leaving McCrone Associates in 1984. Her passion for the microscope and microscopy education often found her at McCrone institute seven-days a week and she always remained involved with the not-for-profit teaching and research organization that she affectionately called home for more than 50 years. Professional microscopists and students alike remember Lucy as the co-author (together with Dr. McCrone and John G. Delly) of the Polarized Light Microscopy course manual, which is widely used today and regarded as the “PLM Bible.” She also served as associate editor of The Microscope journal. Lucy was a skilled chemist and microscopist who genuinely cared for her co-workers and students all of whom she considered her family. Her wish was for McCrone Research Institute to continue fulfilling her and Dr. McCrone’s dream of advancing the microscope and chemical microscopy.